The Options Strategy Evaluation Tool (OSET) is Excel-based options analysis software for the evaluation of options trading strategies -- including the evaluation of follow-up strategies when things may not have turned out as planned. The Options Strategy Evaluation Tool (OSET) lets you construct and evaluate various strategies made up of combinations of trades in puts and calls plus trades in the underlying asset. Four types of options are handled: equity, currency, index and futures. See FAQ for details. OSET will price all options using either the Black-Scholes model or the Cox, Ross and Rubinstein binomial model. Options can be declared as being of American or European-style exercise. Dividends paid on the underlying asset can be specified as being discrete (up to four individual payments, each consisting of an amount and an ex-dividend date) or as continuous (yield pa). You then use the tool to show, graphically using a pay-off diagram or in tabular form, the impact on your profit potential of changes in the underlying price, volatility, and time. Other features of OSET include comparative pay-off diagrams, probability analysis, break-even analysis, automatic position hedging, backtesting, time and volatility modelling, access to real-time option chains and quotes, early exercise analysis, and more. Details below. The options analysis tool is free to download and use. 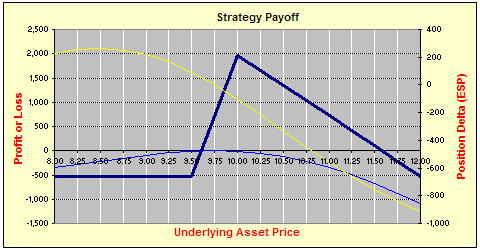 This picture is an example of a pay-off diagram from the Options Strategy Evaluation Tool. The pay-off diagram makes it easy to see how time decay impacts your strategies by letting you decrease the time from deal date to expiration to the point where, at expiration, the time line (bottom line in the example above) merges with the pay-off line. You can vary the time to expiration by selecting a specific date, or by changing the time remaining a day at a time. You can also get OSET to automatically cycle though the days to expiration thus producing an animated picture of the effects of time decay. Payoff diagrams can also be viewed in 3D to simultaneously show profit/loss by underlying price and time to expiry as per the above example of a short butterfly strategy. To enable better viewing of complex 'surfaces' the diagrams can be dynamically rotated both horizontally and vertically using spin buttons (on the right of the above picture). The "Greeks" can be shown in the same way. 3D payoff diagrams are a premium feature, requiring version 10.0h of the Finance Add-in for Excel or above to be installed. The profit if the strategy is closed prior to expiry can optionally be displayed for five dates (time slices) simultaneously on the payoff diagram. The impact of volatility changes after the deal has been entered into but prior to expiry can then be dynamically modelled by clicking a spin button. The results are shown graphically, as above, and also in table form. In the tables the original strategy, the adjusted strategy, and the difference between them (ie the volatility impact) are shown next to each other for each of the five discrete dates to expiry. Negative impacts are shown in red thereby making it easy to see the impacts of changes in volatility on volatility-sensitive strategies such as calendar spreads and strangles. A breakeven analysis is produced for each of the five time-slices showing all breakeven points and the probabilities of falling within the breakeven bands. The impact of future changes in volatility on the breakeven points can be dynamically modelled. In the example pictured above - which has two breakeven points - the analysis would show the probability of falling below the lower point, the probability of being between the lower and the upper point, and the probability of being above the upper point, for each of the six time slices between now and expiry. Time and volatility modelling and breakeven analysis are premium features, requiring version 9.9u of the Finance Add-in for Excel or above to be installed. The strategies compared can be for the same or different underlying assets. If the underlying assets, and hence the underlying asset prices are not related to each other, the tool will still let you compare the two strategies in a meaningful way by representing the underlying asset price as percent change from current price. The impact of using different calculation models (Black-Scholes or Binomial) and different exercise styles (American or European) can also be observed by displaying two versions of the same strategy, but with different calculation models and exercise styles, on the same pay-off diagram. A slider-bar "control panel" lets you dynamically vary volatility, spot, strikes, time to expiration etc. while simultaneously observing the effect on strategy payoffs. For each strategy (which may consist of multiple option and share trades) OSET will calculate the hedge parameters, or "Greeks", (delta, gamma, vega, theta and rho) for each individual strategy trade, and for the entire strategy (ie for the net strategy position). The "position Greeks" provide essential information for traders who, for example, want to maintain a delta neutral position to hedge an entire portfolio. The Greeks can be viewed in tabular form or graphically for any range of underlying stock prices. You can view the impact of time decay on the "Greeks" by changing the time to expiration a day at a time, by specifying a specific date, or by getting the options analysis tool to automatically cycle through the time to expiration. With the premium version of OSET Greeks can be also be produced as 3D charts, which show position Greeks simultaneously by underlying price and time to expiry as per the example above of theta for a bear spread. As for the 3D payoff diagrams, the 3D Greek diagrams can also be dynamically rotated with spin buttons using the controls you see on the right if the picture. Position "Greeks", or hedge parameters, can optionally be superimposed on the pay-off diagram. For example the delta of the entire position -- the equivalent stock position, or ESP -- can be displayed on the pay-off diagram along with the profit data. Traders wishing to hedge their positions can then see the number of shares they would have to buy/short to achieve neutrality -- for the range of underlying asset prices shown on the pay-off diagram, and for all dates to expiration -- in the context of the profit information. Similarly for the other "Greeks". As well as clearly revealing the sensitivity of your strategies to changes in the underlying price, volatility, time and interest rates, (as described above) the Options Strategy Evaluation Tool lets you interactively adjust strategies to remove your exposure to one or both of the two most important of these risk factors: underlying price and volatility. A pop-up control panel lets you adjust your holdings in the underlying or in one or more options trades to achieve neutrality with respect to delta, delta and gamma, vega, delta and vega, or delta, gamma and vega simultaneously. You simply select the type of hedging required (delta, vega, delta-gamma....) and the trades to be adjusted, and the Options Strategy Evaluation Tool will make the adjustments automatically. In effect it enables you to take "standard" strategies like bull spreads, butterflies and strangles, and to turn them into strategies tailored to your specific risk objectives and your view of the market. For instance if you believe, because of an impending major company announcement, that volatility is likely to sharply increase but the underlying stock could go either way depending on whether the news is good or bad then using this technique you could ensure that current positions are adjusted to be delta and gamma neutral thereby removing the stock price risk and allowing you to profit from the expected volatility increase. The pop-up control panel lets you dynamically examine various alternatives to achieving the same neutral outcome, something which is virtually impossible to do manually. As adjustments are made they are instantly reflected on the payoff diagram so you can see the impact on profitability. Once alternatives have been explored you can then either revert to the original strategy or retain the newly hedged position. View demo on automatic position hedging. Automatic position hedging is a premium feature which requires the full version of the Hoadley Finance Add-in for Excel to be installed on your PC. The option analysis tool allows you to backtest any past a strategy by stepping through the strategy from deal date to expiry using actual market data. The profit or loss if the strategy had been closed out at any point in time is calculated so you can see see the effectiveness of various follow up actions in certain market conditions, such as closing early vs closing later vs holding to expiry etc. Data requirements for backtesting are very flexible: Backtesting can either use underlying asset price history data only or it can use option history data for some or all of the past dates if available. If underlying data only is used OSET will calculate option values at each step using the underlying asset price at that step. If option values are provided it will use these instead. Underlying price data can be automatically retrieved from Yahoo Finance, imported from a simple text file (both underlying and option data), or simply pasted into the data sheet. Backtesting can be conducted "one step at a time" or automatically where it will go through all dates from deal date to expiry and save the results on a worksheet for later analysis. At each backtesting step all tables and charts are dynamically updated to reflect profit realized to date. Backtesting is a premium feature which requires the full version of the Hoadley Finance Add-in for Excel version 10.1r or above to be installed on your PC. OSET contains most of the standard strategies: covered call write, straddle, strangle, ratio spread, butterfly spread, bull and bear spreads, calendar spread, etc. These act as templates for evaluating common strategies. However the tool is not in any way limited to these standard strategies and you can construct, and save, any strategy out of the basic building blocks of buying and selling puts and calls, and buying or selling the underlying stock. What is the probability of maximum loss with your call? What is the chance of not ending up between the two breakeven points of your strangle at expiry? How likely is it that the underlying spot price of your covered call will rise 15% at any time between now and option expiry, possibly triggering early exercise? Is the probability of maximum profit larger or smaller than the probability of maximum loss with your bull spread? The answers to the above types of questions are of fundamental importance in managing risk. To help you understand your exposures and the likelihood of strategy success the Options Strategy Evaluation Tool provides a detailed analysis of "end of period" and "at any time during the period" underlying asset probabilities for each strategy. The analysis can be viewed in tabular form, and graphically. In graphical form the probabilities for a range of underlying asset prices are superimposed on the payoff diagram for the strategy. This makes it easy for the probability of hitting key targets, such as breakeven and maximum profit/loss to be read directly from the payoff diagram. Slider controls for "what if" analysis let you dynamically view the impact of making changes to key variables, such as volatility, underlying asset price, and interest rate on all probabilities. An integrated probability calculator can be used to estimate probabilities involving target ranges -- such as the probability of moving outside the breakeven points for a straddle at any time prior to expiration of the deal (particularly relevant for options with American exercise). Discrete dividends paid during the life of the option, which can greatly affect probabilities, are taken into account. Finally, probability cones showing in visual form the most probable range of future asset prices at various maturities are produced for both "at end (expiry)" and "any time (touching)" probabilities. Changes in key variables (volatility, dividend yields etc.) can easily be modelled. Probability cones provide an effective way of understanding the complex relationships between maturity, volatility, interest rates and dividend yields and their impact on breakeven points, and as such are an important tool for strategy selection. Probability/risk management is a premium feature which requires the full version of the Hoadley Finance Add-in for Excel to be installed on your PC. Maximum profit, maximum loss, and "static" returns (ie assuming spot remains unchanged) are calculated by strategy. For each category (eg maximum profit), the type of profit or loss (capped, unlimited), the dollar value and, where there is an initial net debit, the percentage return for the period and the annualized ROI are shown. In addition these numbers can also be calculated for any user-selected target price at expiry. In the case of strategies involving holding or shorting the underlying asset, dividends received or paid are included in returns and the ROI calculations take account of the timing of dividend cash flows. You can therefore see at a glance the real returns you would get from, say, writing a covered call on a dividend-paying stock for the following situations: where the stock price remains unchanged at expiry; where the call is exercised and the stock is called away; and where the stock price drops or rises to any user-specified target level. The Options Strategy Evaluation Tool lets you specify one volatility covering all options for a particular underlying asset. This is often sufficient for strategy evaluation purposes. However, to handle "volatility smiles" (when the implied distribution of the underlying asset is not lognormal and the implied volatility depends on the strike price) and the different volatilities implied by bid/ask spreads with a greater degree of precision you can also specify an implied volatility for each options trade in the strategy. These volatilities are saved along with each strategy. Implied volatility calculator: The calculator takes account of the calculation model used (Black-Scholes, Binomial American...) and any dividends paid during the life of the option. Historic volatility calculator: which automatically extracts historical price data from Yahoo finance (most stock exchanges are supported) and plots historic and forecast volatility using GARCH -- the most advanced volatility model available. The historic volatility calculator also lets you 'model' the volatility smile for each underlying asset so implied volatility can be more closely calibrated to observed market prices. To use the historic volatility features the full version of the Hoadley Finance Add-in for Excel needs to be installed on your PC. See volatility: implied or historical? for more information on the importance of volatility and the tools available. For American options, which can be exercised at any time prior to maturity, the tool will produce a report listing, for each option trade in a strategy, the underlying asset prices and dates at which early exercise could be optimal. The probability of reaching each early exercise threshold is also shown. The report can be used to highlight the risks for option writers and the opportunities for option holders of early exercise. Data for option trades can be entered manually. However the Options Strategy Evaluation Tool will also retrieve on-line option chains from a number of data sources and options can be selected from the list of available options by a simple point and click. A "suggest" button will automatically map a generic strategy (eg a strangle) to actual option trades available in the option chain. This greatly speeds up the process of trade selection and comparison of multiple strategies compared with manual data entry. Take the on-line tutorial for more details. The prices of all options, and the underlying asset, in a strategy can be updated from on-line data at any time by one click of the mouse. Option chain data may be either free and delayed for US, Australian (ASX), and European (Eurex) markets; free real-time for Charles Schwab customers (US markets, including equity, and index option chains), TD Ameritrade customers (US equity markets), Tradier Brokerage (US equity markets), Interactive Brokers customers (US and international equity, index and futures options); or real-time subscription using eSignal (US and international equity and futures markets), Stockwatch (Canadian and US equity markets), or WebLink's BullSignal for Australian equity markets. Option chains can also be imported from a simple comma delimited text file if you have access to data from providers not explicitly handled by the software. See data providers for more information. As well as providing a simple way of selecting options, the option chain facility also lets you compare, for a given option, spread or combination, the impact on profit and loss of increasing or deceasing strikes for a given expiry date, moving to different expiry dates for a given set of strikes, or both. One button click moves the current strategy to the next or previous strike combination or expiry date. On-line option chains are also used to produce a number of "sentiment indicators": put/call ratios (open interest and current volume) , and "open interest configuration" charts, showing the open interest for puts and calls by strike. On-line access to option chains is a premium feature, requiring the full version of the Hoadley Finance Add-in for Excel. For more information on the exchanges and data sources supported, see On-Line Data. The Options Strategy Evaluation Tool (OSET) runs under Microsoft Windows and requires Microsoft Excel for Windows (32-bit or 64-bit editions) to be installed on your PC. For detailed systems requirements, including supported versions of Windows and Excel see systems requirements. View feature highlights for a summary of key features. FAQ page for how to use the software and other aspects of its operation. On-line demos & tutorials which will take you through the all the main features of the software. Once the software application has been installed on your hard drive you can construct, and save, your own strategies without limit. 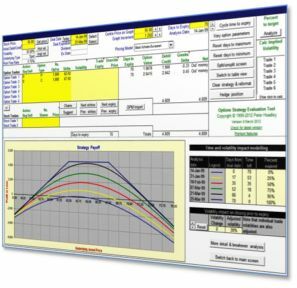 The Options Strategy Evaluation Tool is a turnkey application. It is password protected and cannot be changed. To help you learn how to use OSET there is a brief "how to use the tool" section in the FAQs and on-line demos and tutorials which provide a general overview of the main functions plus some detailed guidance for using some of the more advanced features of the tool. Basic version: The Options Strategy Evaluation Tool (OSET) is free to download. If you don't also have the Hoadley Finance Add-in for Excel on your PC then the basic version of OSET is what you will get. Premium version: If you also install the full version of the Hoadley Finance Add-in for Excel on your PC (either before or after installing OSET), the premium features in the Options Strategy Evaluation Tool will be automatically enabled. There is no need to download OSET again -- your basic version of OSET will be automatically converted to the premium version as soon as it detects that the Finance Add-in for Excel has been installed on your PC. The premium version of OSET is a major step up from the basic version in terms of power and ease of use. See premium features for details. The Hoadley Finance Add-in for Excel also includes these options applications and portfolio analysis and design applications. Hoadley Finance Add-in for Excel: Cost and on-line purchase. Options Strategy Evaluation Tool: Download.